The tenth day of Navaratri – Dusshera or Vijaya Dashami celebrates the victory of good over evil. Whether one considers it the celebration of the Devi’s victory over Mahishasura, or Rama’s victory over Ravana, we celebrate the end of tyranny and evil, and usher in a new era of goodness and righteousness. This is the reason it is considered auspicious to begin new ventures on this day. Be it buying a new house, opening a shop, or starting a course of study, this is one of the most auspicious days to do so. 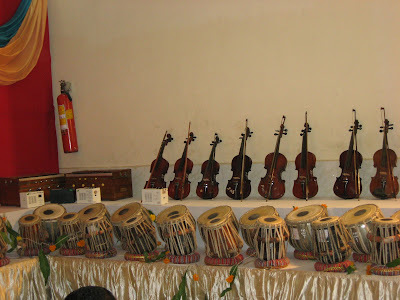 People studying the arts, especially the classical forms like music and dance, begin their classes on this day. This year, Samhith stepped into the vast world of classical music, joining a music initiation course for Tiny Tots at the Chembur Fine Arts Society. 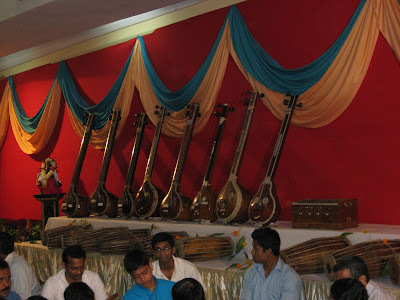 It was a beautiful sight at the hall, which was lined with musical instruments of every kind. The prayers began at 9 AM sharp, followed by a symbolic beginning of each class. I had been wondering what my little one would do in a music class when he doesn’t sit still for five minutes, but my fears were dispelled when I saw some other kids even more hyper than mine, and the teacher, who seemed perfectly at ease with them, and capable of handling these cute, adorable monsters. Wonder how she is going to teach them! In the evening, we went to the temple as usual, preparing ourselves mentally that there would be no new decorations. Samhith was excited when he saw that the decoration pandal was still there, but a little upset when he saw that the decoration was the same as the day before- Saraswati and Brahma. The decoration had been left undisturbed, for the Vidyarambham (beginning of studies) programme in the morning. But we had a pleasant surprise to see that the Devi was being readies for the final day’s procession. The Devi comes out in a procession only on the last day, when there is no other programme in the temple. She goes up to the border (end) of the colony – a tradition similar to what Maharashtrians call ‘Seemolanghan’. We asked permission and took a photo which I am reproducing below. 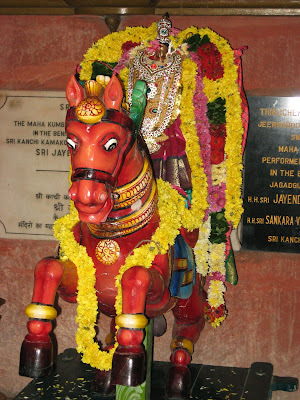 The Devi is seated on a horse, all decked up, looking gorgeous. 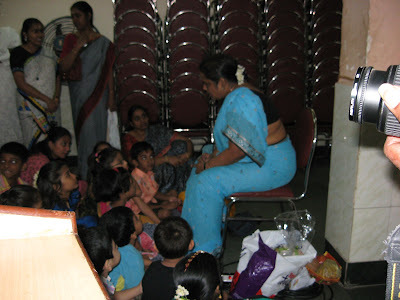 This brings my series of blogs on Navaratri to a close. Even though we were at home, seeing all the decorations gave an experience of virtuall travel, and i hope all those reading these posts too would have experienced the same.